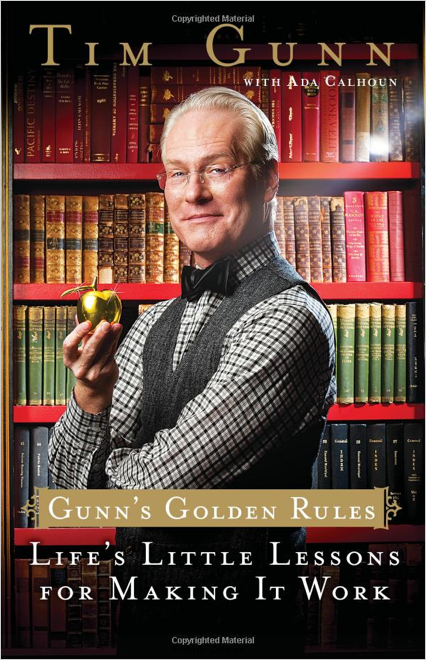 I recently borrowed and read Tim Gunn’s fashion book, A Guide to Quality, Taste, and Style, as partial inspiration for my sewing challenge, and decided that it would also be fun to read his other book, Gunn’s Golden Rules: Life’s Little Lessons for Making It Work. I am really a fan of this book! Organized in to chapters that act as life lessons, this book is really an interesting look into the world of fashion and celebrity. Essentially, this is a collection of rambling stories that work together to highlight character traits we should work to posses or flaws we should strive to overcome. Though at times I suppose this book could feel like Tim is just airing his grievances, the stories are told in such a way that I found them insightful and amusing. This book really feels more like you are having a chat with a friend, or listening to the stories of a relative than that you are being lectured on manners. The book is a mixture of tales from Tim’s personal and professional lives, and all are told with the right mixture of whit, charm, and disdain. I found this book to be a quick and enjoyable read, and I highly recommend it. However, if you are a fan of Project Runway, or any of Tim Gunn’s other television endeavors, then this book is an absolute must read and should be placed on top of your reading pile. Sewing Update – Darn those hems!